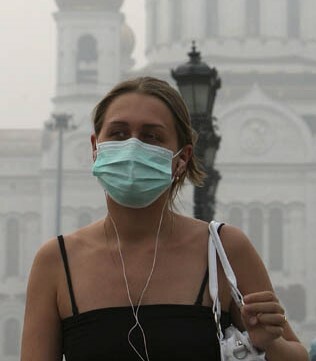 Air pollution has become the biggest trigger of heart attack, according to a study published in "Lancet" Wednesday. Researchers from Belgium and Switzerland analyzed 36 pieces of research on heart attack, and calculated the "population-attributable fraction" (PAF) percentages of different triggers. Air pollution got a highest PAF of 7.4%, becaming the major trigger to heart attack, followed by physical exertion (6.2%). Other triggers included alcohol (5%), coffee (5%), negative emotions (3.9%), anger (3.1%), eating a heavy meal (2.7%), positive emotions (2.4%) and sexual activity (2.2%). Cyclists in heavy traffic are considered in the greatest danger of heart attack, warned the study team leader Dr. Tim Nawrot from Hasselt University in Belgium. He made it clear that cyclists are subjecting themselves to the top two triggers, "polluted air" and "physical exertion". More than 1.2 million heart attacks occur in the United States each year, according to the National Institutes of Health.